In the cycling world, woman carry two disparate distinctions: They are the sport's fastest growing cycling demographic while at the same time they are the most underserved. Betty Bike Gear (BBG) wants to help change the later and by doing so transform the casual woman cyclist into an enthusiast. And as many bicycle retailers know, an enthusiast is more likely to shop at a full-service IBD than at a big box store. Betty Bike Gear produces its own women-specific products (which also appeal to men) that help remove the intimidation factor out of cycling. For example, the BBG Flat Tire Kit not only includes everything a person would need to change a flat tire, but also a tearproof/waterproof illustrated easy-to-use instruction sheet. Bike stores that carry BBG products are discovering that new women stepping into the store and being directed to BBG products are more-likely to return because they feel less-intimidated about cycling. Plus, men really like BBG products because they can purchase them for their wife/girlfriend/mother/daughter to better prepare them for cycling and give the men piece of mind. It's a simple idea: A bike tire repair kit with tearproof/waterproof illustrated step-by-step instructions. 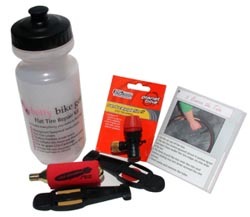 Kit includes instructions, glueless patches, CO2 cartridge and inflator, and two tire levers. Comes in its own Betty Bike Gear water bottle. MSRP: $24.95. An easy-to-use floor pump with printed instructions right on the pump barrel. For both presta and schraeder valves. MSRP: $32. A foldable, tearproof/waterproof illustrated repair sheet. Covers flat tire repair and chain repair. Slip it into a jersey pocket or a saddle bag. MSRP: $5.00. "My goal with Betty Bike Gear products is to make it easier and less intimidating for women to bicycle," says Jen Charrette, president of Betty Bike Gear. "All of our products include easy-to-use, illustrated guides which make things like flat tire repair simple and fast. At Betty Bike Gear we know what women want." BBG designed products are available to IBDs through Quality Bike Products and Bicycle Technologies International. Catering to almost half of the bicycle riding population  women  Betty Bike Gear take the intimidation out of cycling with its own women-specific designed bicycle products. For the complete line-up go to www.bettybikegear.com.